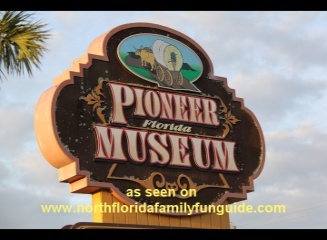 Pioneer Florida Museum and Village is a wonderful family friendly place to learn all about days gone by in a wonderful park like setting. Explore the many buildings filled with antique artifacts that tell so many stories of how life was like back in the mid to late 1800's. Learn all about the Citrus industry and production in the Citrus Barn, marvel at all tools and wagon collection in the giant Tool Barn. The main museum building has a very interesting gift shop filled with all sorts of old fashioned keepsakes, including some local honey, and pure local cane syrup. Your family will love this adventure. Several times a year this museum is host to some wonderful family friendly festivals, such as Wes McDowell's Cowboy Days, in April, and also Pioneer Days, on Labor Day weekend. They have an outdoor stage setup and host many concerts throughout the year by headline acts. I loved this place for all the fun, and also for the educational aspects of it. Music provided by Local Great Walt Leuzinger, which added a very nice local charm to the presentation. You can contact him at wleuz @ live.com to buy his latest CD Dixie Moon, or book him for a concert.